In what would be another addition in the list of unusual news this year, someone or some parties have been caught red-handed impersonating the exchange platform Bakkt. The act was uncovered after someone claiming to represent Bakkt sent emails to news agencies and appealed for funds. The email also includes a link that redirects the user to a webpage, bakktplatform.io, supposedly the homepage for the endeavor. The page in question invites and solicits all investors to join the platform if they “believe in the future of the cryptocurrency market”. The platform seeks $50 million in what it claims to be the second round of Bakkt fundraising and asked investors to make contributions to the platform’s Bitcoin wallet through a minimum transaction value of $100 and a maximum of $25,000. The platform in question also promises its investors a guaranteed 27.5% return on their investments. 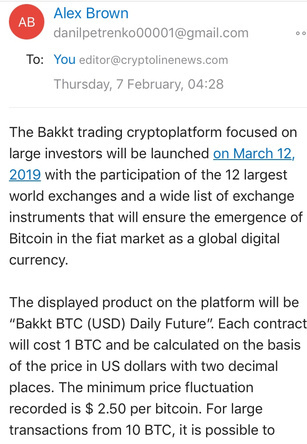 The homepage also goes on to announce a launch date of March 12, despite the fact that no such date for Bakkt has been announced on any other media anywhere. Like the email, the page itself has a lot of red flags. The home page, which is now archived, is littered with spelling and grammatical mistakes. The language apart, it displays no information or links to any of the exchanges the platform claims to be partners with. Further, some investigations have suggested that the website was launched on the back of a domain-owner obscuring service, further implicating the party behind the website as an impostor. Intercontinental Exchange, the parent company behind Bakkt, has already confirmed the fact that the platform is a fraud and that there has been no communication between them and the party behind bakktplatform.io. As of now, no coin has been verified to have been sent to the Bitcoin wallet address in question. In fact, considering how bad the scammers in question have been at trying to impersonate Bakkt, it doesn’t seem like anyone is going to fall for this fraud.